What Is SEC Rule 15c3-3? Enacted in 1972 by the SEC, Rule 15c3-3 is designed to protect client accounts at securities brokerage firms. It was adopted in response to the 1968 Wall Street Paperwork Crunch, which resulted in the failure of many firms and significant losses to their clients. In short, the rule dictates the amount of cash and securities that broker-dealer firms must segregate in specially-protected accounts on behalf of their clients. The intent is to ensure that clients can withdraw the bulk of their holdings on demand, even if a firm becomes insolvent. At least once a week, broker-dealer firms must tally up what they owe to clients and what clients owe to them, in both cash and securities. If the amount owed to clients exceeds the owed from clients, the firm must lock up a portion thereof (the calculation being dictated by Rule 15c3-3) in a “Special Reserve Bank Account for the Exclusive Benefit of Customers.” The cash and securities segregated therein cannot be used by the firm for any purpose, such as trading for its own account or funding its operations. The amount in this account can reach billions of dollars for a single firm. The calculation has complex adjustments related to derivatives and lending arrangements. There also are risk levels assigned to various classes of assets, which also can modify the computation in complicated ways. Critics note that, in a serious credit or liquidity crunch, clients may not be able to meet their own obligations to a broker-dealer firm in a timely fashion, if at all. As a result, in their opinion, the amounts being set aside under Rule 15c3-3 are much too low. In response to the failures of Lehman Brothers and MF Global, in which billions of dollars in client funds either were lost entirely or only recouped after years of struggle, the SEC tightened this rule. The SEC is investigating whether Bank of America and its Merrill Lynch subsidiary used a complex strategy to circumvent Rule 15c3-3 and boost profits, thus putting the accounts of retail clients at risk in the process. The allegation is that this scheme ran at Merrill Lynch for at least 3 years, ending in mid-2012. Bank of America, which acquired Merrill Lynch in 2009, already has paid out more than $70 billion in settlements stemming from the 2008 credit crisis. One scheme used by Merrill Lynch was called a "leveraged conversion." In it, a few high net worth clients were enticed to deposit extra cash (in some cases reaching into the millions of dollars) as collateral for loans valued at almost 100 times more. The immediate effect was a dramatic rise in what clients owed to Merrill Lynch, an equal fall in the net liabilities of the firm to clients, and thus a reduction in the size of the lockup account. At times, this scheme freed up as much as $5 billion in funds, out of a lockup account that otherwise would be worth up to $20 billion. The savings in funding costs (by being able to deploy these funds elsewhere in the firm and thus eliminating the need to raise a like sum through bank loans or the public debt markets) was about $20 million per year. 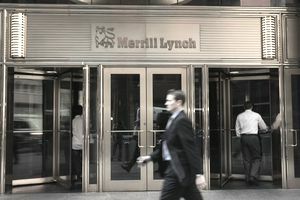 Additionally, Merrill Lynch used the leveraged conversion scheme as a risk management tool for its trading desks. If a trading desk had acquired a particularly large position in a given security that it wanted to hedge, it could offload all or most of it on those high net worth clients, using the loans already provided to them for payment. How these clients profited from participating in leveraged conversions is unclear. Sources: "What's the Big Deal About Rule 15c3-3," wsj.com, April 28, 2015; "SEC Probes BofA Over Merrill Tactic," The Wall Street Journal, April 29, 2015.